Description: When respected ex–Canadian Forces commander Bern Fortin cuts short his military career to take a job as the coroner for a small mountain town in the heart of BC, he’s hoping to leave the past behind. Bern’s looking forward to a quiet life, but the memories of what he witnessed during his stints in Afghanistan and other war-torn countries haunt him still. When the body of one of the workers is found floating in the huge bottle-washing tank at the local brewery, Bern is called in for a routine investigation. What first appears to be a tragic accident takes a menacing turn when the body of the worker’s girlfriend is discovered in a nearby field. Bern needs the help of brewery safety investigator Evie Chapelle, who, burdened by tragedies she might have prevented, is more determined than ever to keep her workers, and their tight-knit community, safe. Soon, Bern and Evie find themselves risking their jobs—and their lives—to killer hiding in a place where it is awfully hard to keep a secret. Deryn Collier’s debut novel is a taut mystery full of suspense. 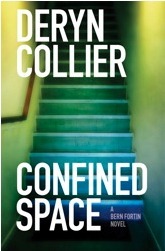 Confined Space was shortlisted for the Arthur Ellis Award for best unpublished first crime novel by the Crime Writers of Canada. Lots of intriguing well drawn secondary characters, especially Mrs K.
"Evie wasn't sure how these two set of appearances - safety and youth - were supposed to mesh. She did know that she had turned forty just a few months before, and Lycra was not something that should still be part of her wardrobe." "He's carefully restored the original cerulean-blue bathtub and tiles with new caulking and a lot of elbow grease, but he'd upgraded the showerhead to one with multiple spray patterns and an intense massage feature. Some parts of military life were easier to let go of than others: the lukewarm, low-pressure, or nonexistent showers of in-theatre operations were a thing of the past." "Sorry about that, my niece is here. She's glad you called, because I'm going to let her watch TV while we talk."